I’ve been playing through L.A. Noire for the last month and a half on Kotaku’s Twitch channel. This weekend we finished the game. The conclusion is bittersweet but there was no other way for a tale of crime and corruption to end. Controversial in its day, L.A Noire’s ending is perfect when viewed in retrospect. Cole Phelps is a flawed man. He is smug, obsessed with authority, eager to seek personal glory, and all too quick to prove to everyone on the police force how smart he is. Throughout the game, Cole (and the player) rises through the ranks of the LAPD with dozens of successful cases. For a time, the game’s progression loop is simple: get assigned to a different beat, clear a handful of cases, get a promotion, and do it again. This changes near the end of Cole’s time in Vice Squad. Phelps is a mystery to many of his peers, a war hero who is fiercely private of his achievements and personal life. He is equally unknowable to the player outside of the persona he wears as a cop. At the end of Vice desk, Cole, who is married and a father, follows a nightclub singer named Elsa back to her apartment and sleeps with her. It comes without much warning. Players are made to walk down the hallway to her apartment with only a vague sense that this will not further the case. It doesn’t. Phelps is not an avatar that players command, he is a character with his own agenda. This moment of weakness leads to a formal charge of adultery and demotion to Arson desk. Arson is L.A. Noire’s final segment of cases. Phelps and his new partner Herschel Biggs investigate house fires, all seemingly linked to a major real estate mogul with powerful friends, including the mayor and chief of police. Phelps is a man beholden to the system of law. Unable to do anything from his weak position in the police force, he asks Elsa to rope in his former war comrade Jack Kelso into investigating the conspiracy. 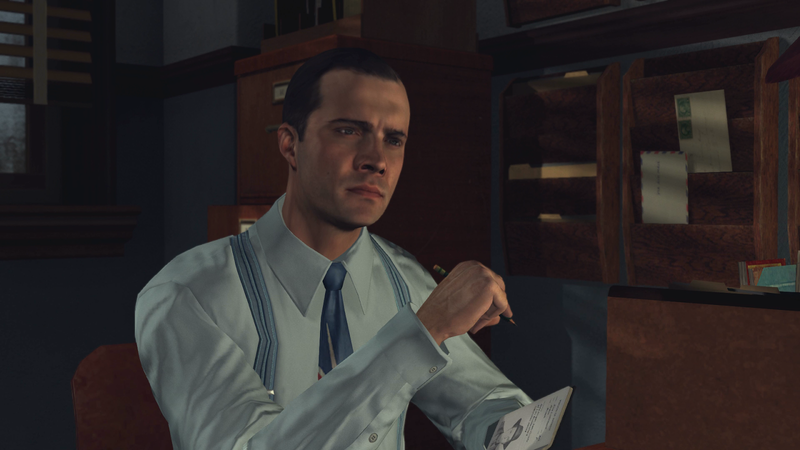 Jack Kelso is the hero of L.A. Noire. When Elsa walks into his office with a mysterious case to solve, the game changes from police procedural to proper noir. It shifts from Homicide: Life on the Street to L.A. Confidential. Elsa is the femme fatale. Jack is the plucky investigator with all of the smooth one-liners. Much of Arson desk isn’t even spent playing as Phelps; it is spent following Kelso’s rough and tumble action adventure attempts to topple the real estate magnate and his cohorts who have been building cheap homes and burning them down for profit. L.A. Noire spends over 20 hours with Cole Phelps and his dogged police work before admitting that sometimes there are powers too corrupt and too large to be taken down by someone so beholden to and enamored by traditional power structures. Phelps is a decorated war hero who only got a medal for being the last man standing in his platoon. Every promotion, every closed case, and every perp locked away is a means for Phelps to prove to himself and to the world that he actually can be the hero that Uncle Sam decided he is. Kelso cares for none of it. Courage, he tells Phelps, is “a tenuous and fickle thing.” As long as Phelps seeks approval and confirmation from others, he’ll fail to be his own man. Unless he is honest with himself, he will never be the hero. As the conspiracy is slowly chipped away and exposed by Kelso’s investigation, the culprit of the arsons is fully revealed. Ira Hogeboom, a Marine from Phelps’ unit, was driven mad from his experiences in the war. Phelps was his commander and, following standard protocol, ordered him to burn out a cave full of Japanese soldiers; it turned out to be a hospital. Phelps’ adherence to the system damaged Ira irreparably. When he returned home from the war, he was manipulated by the conspiracy into burning down homes before going rogue to burn anything and everyone he saw fit. The finale of the game sees Phelps and Kelso face to face with Ira in the middle of a flooding sewer after he’s kidnapped Elsa. Kelso wants to put the man out of his misery; Phelps wants him arrested. If they can get Ira to confess, they can close the whole case. He still can’t let go of his love affair with the system. But Phelps makes a crucial choice; he leaves Kelso to deal with Hogeboom. Jack kills him out of pity. As the sewer floods and water rises, Phelps makes one more choice. He manages to find that tenuous and fickle spark of courage and saves his friend from the rising tide before a swell of water floods down the pipe and kills him. Phelps gets to be the hero, if only for a moment. In giving up on personal glory, he earns his medal. This death is sudden and pointless but that’s how these things go. Cole Phelps has to die; the tide is too strong and corruption too deep. He’s in way too deep to avoid drowning. L.A. Noire ends with Cole’s funeral. The eulogy is given by Roy Earle, his partner from Vice Squad. Earle was in on the conspiracy and gets away with it, as do the mayor and chief of police. Kelso’s benefactor, the former assistant DA, got them to make a deal and turn in the other conspirators. In Los Angeles, it’s all about shaking the right hands. Cole can find redemption and Kelso can crack a few skulls, but the wheel of corruption will always spin. As a video game ending, this is bleak. As the conclusion of a noir story, it’s perfect. You can bloody some noses and save a few lives but the grift will go on.